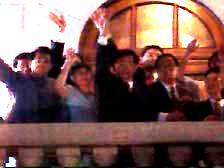 Members of the Democratic Party, the largest bloc in the Legislative Council (Legco) elected in the 1995 democratic elections, wave goodbye on a balcony in the Legco building. They were to be replaced by an appointed Provisional Legislature. A year later, several of these legislators, including party leader Martin Lee, would be back in Legco, elected under a more limited franchise (20 of 60 seats were directly elected in 1998). The Democratic Party is self-described as the most powerful voice for democracy and rule of law in Hong Kong. 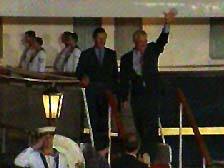 Prince Charles and Christopher Patten wave goodbye to Hong Kong, as they board the royal yacht, HMS Britannia to leave Hong Kong. 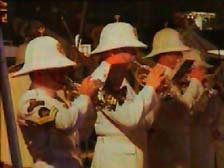 As the HMS Britannia leaves, the band on board plays despite the rain. 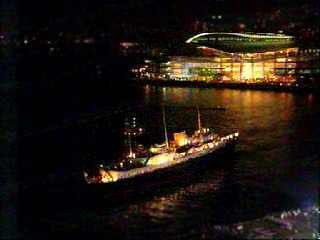 With the Convention Centre in the background, HMS Britannia sails away. HMS Britannia was on its last voyage, since there was no longer enough money in the royal purse to maintain it. 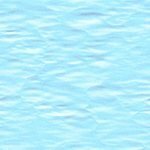 Even though the music was playing, the heavy rain and darkness gave cover to the British farewell as they disappeared into the night.